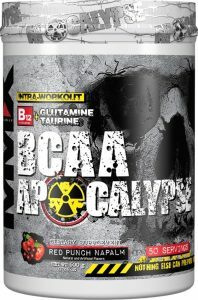 All the best Muscle Maxx BCAA Apocalypse deals in one place! Compare prices from all the top online stores to find the best price on Muscle Maxx BCAA Apocalypse. Fitness Deal News does the hard work for you of finding the best deals & coupons on everything fitness. Muscle-Exploding BCAA Power! Highly Potent, Highly Effective!Muscle-Exploding BCAA Power! Highly Potent, Highly Effective! Itâs simple… Aminos like BCAAs are the driving force behind the anabolic power of protein…THEY BUILD MUSCLE. When you’re killing it in the gym, you need Aminos like BCAAs, Glutamine & Taurine to halt muscle loss & get you set up for serious muscle gains. HIGHLY POTENT, HIGHLY EFFECTIVE. HIGHLY POTENT, HIGHLY EFFECTIVE. Nothing keeps your muscles going like BCAAâs during your intense workouts. Our no-nonsense highly potent BCAAâs are the best there is. But thatâs not all, we added a [email protected] blend of B6 & B12 to ramp up your metabolism and give your body the raw materials needed to effectively use and absorb the BCAAs themselves. If youâre building muscle then you know BCAAs are the best to increase the rate of muscle growth. Why? Because while other aminos are processed by the liver, BCAAs are absorbed by the muscle directly which cuts down on muscle tissue breakdown. If you want to build quality muscle fast then BCAAs are where itâs at. So, what are BCAAs anyway? So, what are BCAAs anyway? The BCAAs are Leucine, Valine and Isoleucine.The BCAAs are Leucine, Valine and Isoleucine. To help stop muscle tissue breakdown we brought in the reinforcements with L-Glutamine. Glutamine supports your muscle glutamine levels, prevents tissue breakdown and increases recovery. Donât forget Taurine for improved mental focus and energy. It also acts as a cell volumizer by drawing water into muscle cells, getting more nutrients where it needs to be for better recovery and growth. PREPARE FOR THE APOCALYPSE.PREPARE FOR THE APOCALYPSE. Mix it with ice-cold water, slam it back, hit the iron, and leave the rest of the [email protected]#king world in your dust! Ideal for use before intense physical activity. Stay adequately hydrated.